Bare with me folks this is going to be a long one but well worth it!! A few weeks ago we posted an interview with a designer/founder of an up and coming female apparel company and the response was outstanding. The founder is Susan Hess, the company is Golftini, and the clothing, well the clothing is just magnificent. Like many women Susan Hess did not like her options in golfwear, specifically skorts. All she wanted was a cute black skort, when she couldn’t find one she made one and the rest as they say is history. We first contacted Susan after a reader of ours said she swears by Golftini’s clothing, she said there are no skorts out there like it. Susan, and her business partner Samantha, were a pleasure to work with and sent us five incredible outfits from their spring line to review. Outfit number one was a white pleat skirt with rainbow ribbon and a hot pink polo. My first thought when I saw the outfit was, simple and adorable. When I tried it on I thought, hot and sassy! They turned a simple white skort into something special by adding pleats and a ribbon. The fit was great and the length is modest but still shows a little leg. The hot pink polo has a zip front and low collar, a huge plus to me because I hate when collars are too high on my neck. The slits at the bottom have a great little design to add that extra feminine touch and the best part of the shirt, the Golftini martini glass logo on the bottom corner, it’s so fun! The second outfit was a pink and black flower striped skort with a white t-shirt and hot pink vest. At first glance I wasn’t so sure about the skort, the pattern seemed a little busy for me, but wow was I wrong. When I put it on I fell in love, the pattern was not busy at all. The bottoms were quite flattering and very figure friendly, vertical stripes are a girls best friend. The white t-shirt was just that, a simple white shirt in a high quality fabric. My favorite piece in this outfit was the hot pink vest with the signature martini glass on the bottom left corner. I loved the color, I loved the fit, but I really loved the fabric and the fact that it had no tags. The vest was so soft it felt like cashmere, and I loved not having an itchy tag. The third outfit was a Japanese flower skort and a black sleeveless polo. It was love at first sight for me, and it was the first one I wore to the course, I couldn’t wait. The skort is black with a Japanese flower print that is so cute, so colorful, and SO comfortable. The vibrant colors from the flowers really makes these bottoms pop. The black sleeveless polo has the zip up front and low collar like the hot pink polo. I added a black visor along with pink and white golf shoes and I was set. I had so many compliments that day on the course, everyone wanted to know where I got my outfit. The last few items we received can be mixed and matched to create four incredible looks. One option is a three-quarter sleeve white sweater paired with a turquoise pleat skirt with white pin stripes and a white ribbon belt. Of all the skorts that I had the pleasure of trying this one was by far my favorite. The turquoise color is complimented so well by the white pin stripe, if they were pants I would totally wear them to work. Another option was a Khaki Crochet skort and a white short sleeve polo with the same zip up collar. No matter how you pair it, white polo and khaki skort, white polo and turquoise skort, turquoise skort and white sweater, or khaki skort and white sweater you can count on one thing, you will be the best dressed person at the club. I tried and tried to find something I didn’t like about the Golftini Spring line but I couldn’t. The colors are great, the fit is great, the style is great…what can I say the clothes are just great. I forgot to mention earlier why I love the fit so much. Have you ever noticed that the shorts part of a skort are often spandex and rather tight? Not Golftini, the shorts are lose and allow you to breath, so when you take the skort off there are no red lines all over your thighs. It may sound silly but that really won me over. When I first starting researching Golftini I thought the clothes looked cute, the skorts were cool, the ribbon was nice and I was excited to give them a try, but I had no idea what quality I was about to be introduced to. Susan Hess knows what women want, she knows how to take an ordinary item like a skort and turns it into something truly special. Golftini is the essence of style and class, I have yet to find an item in their spring or even fall line that I have not liked. Golftini is now a staple in my wardrobe and not to sound too much like a salesperson, but the minute you try out their clothes, I believe it will be a must have in your closet too. To read more about the wonderful products that Golftini puts out or to see more of their items head on over to Golftini. Wow! Never heard of them before. But off I go to spend some more money. Looking at their site it does not look like I can purchase from them. Do you recommend a place to buy it? I must have some of their skirts. All I can say is thank you. My favorite brand out there and you of course have them covered. You are my hero! Their new spring line looks great. These are the nicest skorts I have seen yet. I do not own any Golftini, but that is fixing to change. There is a store local to me that carries them, and I believe that this site profiled a store not to long ago that did as well. I just love Golftini, and I’m so glad you’re spreading the word! My wife has been wearing one of their skirts for about a year now. This new stuff is right up her alley. You just made my Christmas shopping easier. Great news everyone!! I just spoke with the wonderful ladies of Golftini and they said the online store will be launched this afternoon. Perfect timing for the holidays : ) I promise you will not be disappointed, they really do make incredible clothing, and by far the best skorts I have ever seen. My favorite clothes are now finally here. I love this site and check it everyday. While the site is loading I wait and hope to see more Golftini stuff. The interview was great. This is better. Golfergal, you make my life so much easier in picking out my new stuff to wear. Thank you. I must say that I do not usually wear skorts. I find that they show off the wrong places. But these look so fun that I am going to have to give them a try. A local store near me in PA has their line and with this review I am going to get on the horse and give it a try. Here is the short version. I had not heard of Golftini until you did the interview with them last week. I had been looking around but had not purchased anything. After reading this review I had to have some. Just bought 2 skorts online (not at their site) and cannot wait to get them delivered. This was the find of the year for me. Thank you GG. Like many of the posters, I had not heard of this line either. But they are wicked cute and absolutely must get one soon. Thanks for the great review. Wow, just checked out the prices and did not realize they were so high. I thought they were around $80 bucks. This is a little out of my range for gifts for her this year. But there is always next year. Nicest golf clothes I have seen to date. Thanks for a great review. Great review. Thank you for opening my eyes to so many new lines the last few weeks. This one is tops in my book though. As to Mike that posted above. You get what you pay for sometimes in the world of ladies golf apparel. These clothes are so nice. Thank you. I am new to your site and did not know Golftini. Now my husband will know what to get me for the holidyas. Great Review! This is by far the best clothing line I have seen. I’ve been wearing Golftini for the past two years and it’s now the only clothing line I will play golf in. The nice thing about this line is that you can wear it off the course as well. Looking forward to the 2009 line. 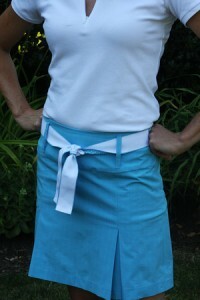 I’ve been a huge fan of Golftini from the beginning – the skorts are a must have for any golfer from beginner to pro! Great fit and they wear beautifully. I’m psyched that I can shop and purchase online. Treat yourself now if you don’t already own one! I read a different review and now this one and my wife wears this stuff too. Golfer Gal, you are dialed into what the nicest stuff is. This is one the best written reviews I have read. She only has 1 skirt from them but after seeing some of the photos above, this might be a nice christmas present for her. Thanks for the reminder. WOW! Just found this site and you guys write exceptional reviews. I have not heard of Golftini before but I do now and I am glad I found it. I also just found out that a place local to me sells it, so I am going to head down there this weekend and see if it looks as good on as it does on the site. Based on this review I bought my wife a skort from them. She loved it and Im back in her good graces. Thank you so much. I purchased the grey golf slacks several years ago in size 0 (they also were striped)..The store from which I purchased these favorites has gone out of business. I do not see anything similar or your website.. Do you know where I can get another pair or even if Golftini has made any of that style or similar styles?